Living in Singapore during the hotter months can be quite uncomfortable without an air conditioner. You can ensure that this comfort will last if you take care of your air conditioner and service it regularly. General cleaning may not do the job however most times. 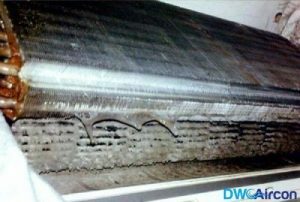 When regular maintenance is inadequate to bring your aircon back to optimal working condition, we recommend having an aircon chemical wash done for your aircon. Allergies – Aircon chemical cleaning helps to remove allergens, dust and dirt from your air conditioner. This gives it cleaner air which would reduce the chances of those in your home suffering from allergic reactions. Aircon chemical wash price saves you a lot more in medication and hospital bills. High electricity bills – an aircon chemical was has the advantage of improving the efficiency of your aircon. This happens by making it cool better and faster and so you don’t have to keep it on all the time. With less usage, this helps to bring your electricity bills lower than usual. An aircon chemical wash must be carried out by a reputable aircon chemical wash company because of the amount of work involved. The aircon technician will strip the aircon down to its components and use a chemical solution to wash everything. This solution will dissolve away any particles, accumulated dirt and other issues that may be giving you problems with your aircon. After the aircon unit is re-assembled, you will be able to see the difference in your electricity bill and increased comfort at your home or office. 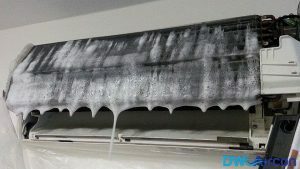 Aircon chemical wash must be undertaken by experienced air conditioner technicians in Singapore to make sure that it is done professionally. Our staff are all licensed and trained in aircon maintenance, installation and repair. 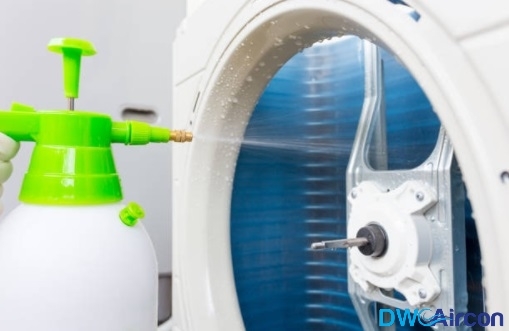 Aircon chemical wash is not a DIY project, leave it to us at DW Aircon Service and allow us show you why we are the top rated aircon chemical cleaning service in Singapore. Call us today on +65 6653 2988 or email us at enquiry@dwaircon.com for a free consultation today.